I was given Series 1 of STAY LUCKY for my birthday and I had no idea what it was like .. but to be honest.. this is not how I'd like to see Dennis and I haven't even watched the episode 1 in total.. I recall it being quite good but I haven't seen it since it was originally broadcast a hundred years ago. I have only seen the very first episode but unfortunately I found it a little disappointing. This meant I didn't tune into any further episodes. I find this hard to watch as Dennis still looks like series 7 Terry in this one and I almost wish he had stayed as Terry McCann in the series. 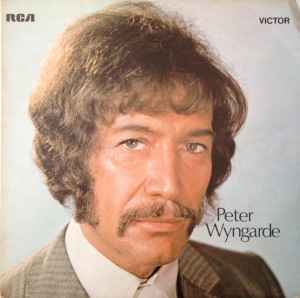 I am pretty sure swainy once mentioned this was like "the Northern adventures of Terry McCann" which is right - just watch this clip and think of Dennis as Terry McCann, it is just like watching a slightly older Terry McCann to me, without the punch ups of course. Cheers for that brilliant and very informative addition. It's so good to have this place, so helpful to gather information. Thanks a lot to everyone on here! Haha, used to watch this, always waiting for the real Terry to show up and start bopping people, his character in the show just needed that extra. Mind you, at the time, we also all watched it for Jan Francis, hot in a mature lady type of way, just after just good friends. Posh totty you know you secretly wanted to crack! I enjoyed it. It wasn't the same after Jan Francis's character left at the end of Series 3: Susan George's character was a bit wooden (Dennis Waterman makes some very disparaging comments about her in "Reminder"). The chemistry between Dennis's and Jan's characters was great, and Niall Toibin and Emma Wray made good "second rank" characters. And it was filmed in West Yorkshire so I always enjoyed seeing if I could recognise any locations around Leeds where I grew up. I liked Jan Francis in Minder and in other things I've seen her in, but I have to admit, she was most annoying in this show. I didn't like her at all and actually thought the show's final season without her was its best. Apart from that, is there anything else you could add about the content of the show daytona? I really just remember that it seemed to be 'Terry' without his muscles to sort problems out, with the same 'heart of gold' he had in Minder. Ultimately, it was a pleasant way to spend an hour, and far better than watching some of the dross they produce now, like I'm a Celebrity in a brother's house cooking cakes and finding my past. I have still yet to make it past episode 1! 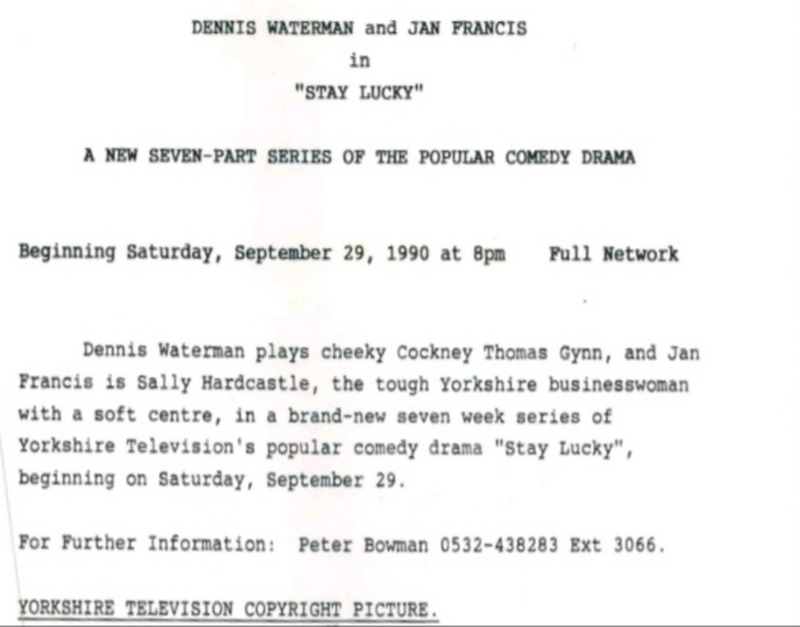 I recently bought all 4 series of Stay Lucky on DVD during the Network 60th anniversary of ITV sale. All of the sets are still in their cellophane wrapper! For some reason, I just can't find the motivation to watch them. I actually remember the first episode from 1989 when I was 12 quite well - something along the lines of Thomas hitchhiking and getting picked up by a gay lorry driver!! I hope this is correct! Then later on, he gets picked up by Jan Francis in a gunmetal grey Mark 2 Jag! A somewhat better proposition! I am sure I will watch them at some point but I can't imagine they will be that exciting as I remember the rough gist of the series. I remember being almost annoyed that DW did this instead of Minder, rather in the same way I found it almost annoying to see GC in An Independent Man, My Good Friend and Dad etc when he could have done more Minder! I know Minder had been long since cancelled but all the main actors involved could have done another couple of series potentially. I saw a snippet of an ep of Stay Lucky on You Tube a while back - Amanda Burton in the early 90s playing a tax inspector does seem ever so slightly far fetched! I remember thinking Jan Francis was great when I was very young but I saw a few minutes of an afternoon repeat of Just Good Friends a few months ago and she seemed really annoying! Maybe it was just the scene though! I have to agree with all that flashchris. It does seem annoying to Minder fans that this stuff is created when Minder is clearly so much better. Particularly so with "An Independent Man". A weak Gary Webster Minder episode is still far more enjoyable than this show or GC's "An Independent Man" which us Minder fans will associate as a replacement as our stars are seen doing other stuff. I can and have watched DW in lots of other stuff but "Stay Lucky" in particular I find very hard to stomach. Clearly a classic example of 'you don't know what you've got till it's gorn'. I just watched the 4th series' 3rd episode, A Quick Killing, which seems like an homage to Minder. Terry, oh, I mean Thomas, buys a cell phone (the big early 90s clunky ones) as part of a new business venture he's starting, and then Pippa uses it and ends up racking up a 1,000 pound phone bill. Thomas is left with threats of being dragged into court to pay the bill, so he has to resort to selling cars to make the money to pay for the bill. He finds this business exec who is looking to buy some vans and Thomas is able to locate them and make himself the money back for the phone bill, and end up with a little earner. This business exec wants Pippa to "sweeten the deal" so he'll sign on the dotted line, which forms another subplot. There's also someone who is believed to be a repo man looking for Thomas, and the original seller Thomas was hoping to purchase the vans from, goes bankrupt after taking Thomas' 1,000 pound deposit. The whole episode has me thinking it's Terry trying to get Arthur out of this predicament! It ended up being one of the best Stay Lucky episodes, for sure. 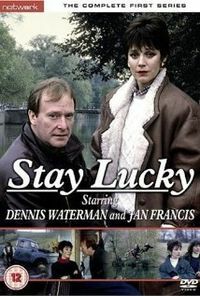 I have always liked Stay Lucky, watched the series when it was first shown, and have seen all 4 series, on DVD, more than once, I have always thought the episodes of Stay Lucky, were consistently good, and I liked the cast, Dennis, Jan Francis, Emma Wray and Niall Toibin, disappointing that Jan Francis, wasn't in the final series, but it was good to see Susan George (one of my favourite Actresses) and Leslie Ash, appear in the final series, apart from Jan and Emma Wray (who appeared in episodes of Minder), other guest stars from episodes of Minder, also appeared in episodes of Stay Lucky - Rula Lenska, Michael Kitchen, Anthony Valentine and Moray Watson, there were probably others, who I can't think of at the moment, I have done quite a few screencaps (featuring Pub Signs) from Stay Lucky, there was one episode (called Poetic Justice), where Thomas and Sally, went to York, in pursuit of Julie T. Wallace's character Vi, and in that episode, about 10 Pub Signs, were seen, below is a Press Photograph (which I obtained on eBay), featuring Dennis Waterman and Jan Francis. Written below, the words that can be found on the back of the above Press Photograph. 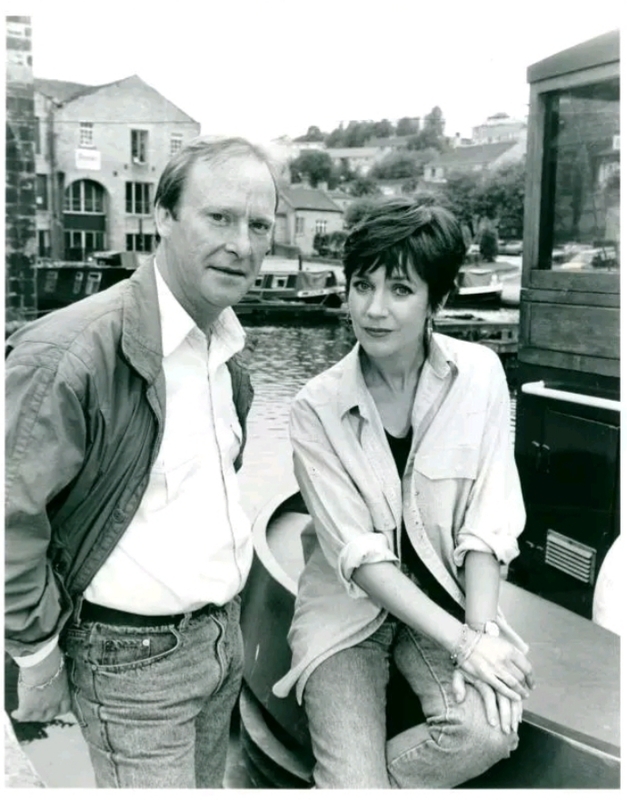 The action reaches fever pitch for Thomas and Sally (Dennis Waterman and Jan Francis) in the final episode of "Stay Lucky"
Looks like the same clobber as the DVD cover to me billy. 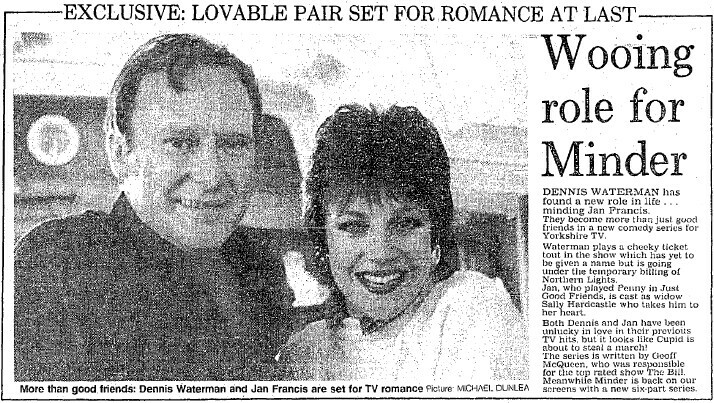 Daily Express, December 31st 1988 - Wooing role for Minder. 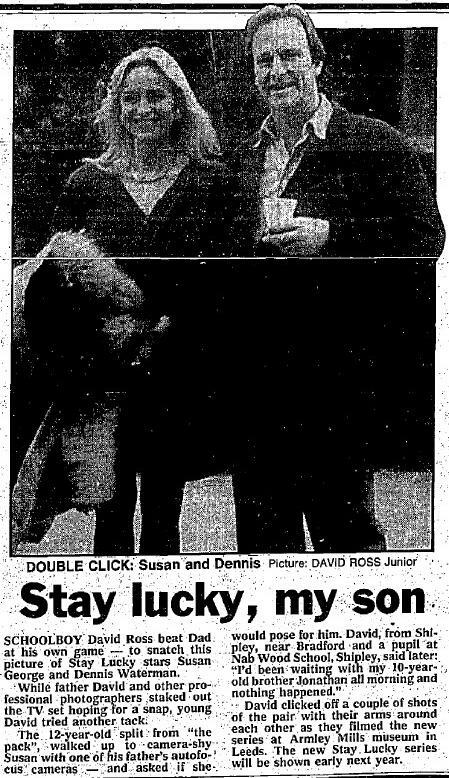 Daily Express, August 13th 1992 - Stay lucky, my son. Great articles there billy - interesting that Dennis signed up for this with ITV before the final series of 'Minder' had even been broadcast. ONESImus he he he ONESIE.. does look like a boat! I really enjoyed it. This time more than I did when it was originally aired. £12.60 on Zoom. Use SIGNUP10 code to get it for this price. If you already have an account you don't have to set up a new one because the code works anyway. I have used it many times! As of today, £31.98 on Network's site. 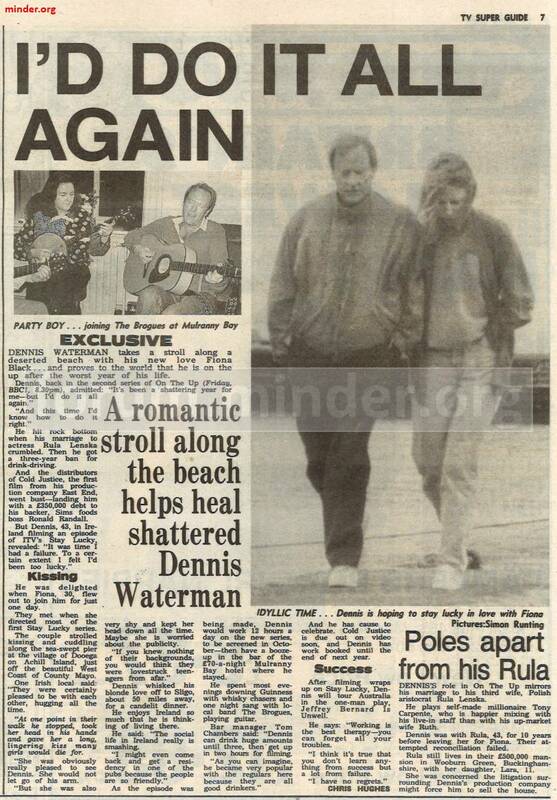 Article on our Dennis and filming in Ireland from The Sun on 31st August 1991. Well after picking up the complete series boxset for next to nothing, I finally got to the end of series 1 (all three episodes). I have to say, it wasn't all that bad and was better than I had expected. A mixture of drama with a bit of comedy (possibly a bit too OTT on parts) - no laugh out loud moments though. As daytona mentions above this is Terry McCann without the muscles - Dennis in very cockney mode. I think swainy's description of 'Terry McCann's Northern Adventures' sort of sums this up. 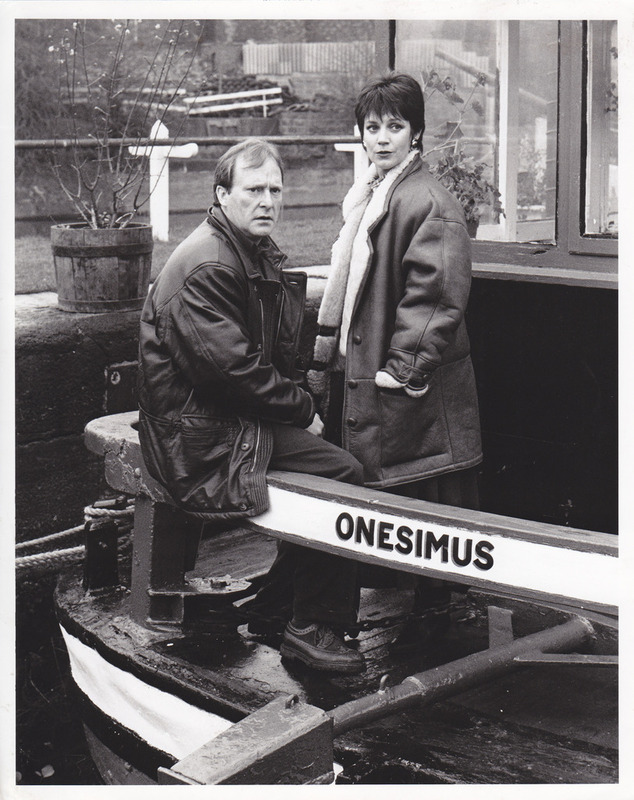 Dennis's character Thomas Gynn is (essentially) on the run up north and befriends Jan Francis's character Sally - Thomas is a bit of a loser and doesn't have much luck (he is very much like Terry McCann in this). Series 1 gets a decent 7/10 from me. To be honest, this reminded me a bit of 'Lovejoy' without the antiques and the fourth wall of course. On to series 2 it is. 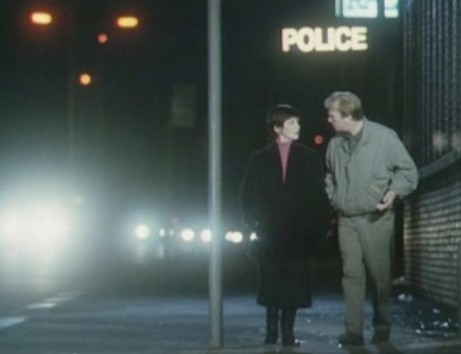 Half way through series 2 and we have an episode concluding with the two leads walking out of a police station. Remind you of another show? Dennis could so easily have done another series of Minder - blatantly obvious watching this where his character is 90% Terry McCann.